Wireless networks that use visible light instead of radio frequencies could soon become a reality, thanks to a new $18.5 million (£10.5 million) project at Boston University. 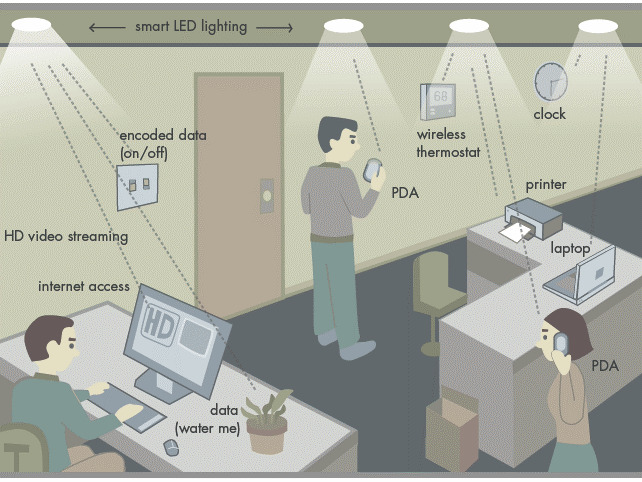 Researchers expect to piggyback data communications on low-power LEDs at between 1 and 10Mbps, to create a hyper-connected 'Smart Lighting' network that's more secure than current RF technology. "Imagine if your computer, iPhone, TV, radio and thermostat could all communicate when you walked in a room just by flipping the wall light switch," said Boston University Professor Thomas Little. "An LED-based communications network could also provides light – all over existing power lines with low power consumption, high reliability and no electromagnetic interference. Ultimately, the system is expected to be applicable from existing illumination devices, like swapping light bulbs for LEDs." The new Smart Lighting Engineering Research Centre will have 30 researchers developing the new technology. The difference with LED lighting is it's digital (i.e is either on or off), so can be switched on and off at very fast speeds, naked to the human eye. This flickering is picked up by the device, and converted into data using much less data than RF systems. Because light can't shine through walls, Smart Lighting should be much more secure than Wi-Fi, although, of course, it also means that you'll have to fish phones, cameras and computers from your bag for them to make a connection. But don't go binning your draft-N router just yet - the Smart Light Research Centre is working to a 10 year timeline.